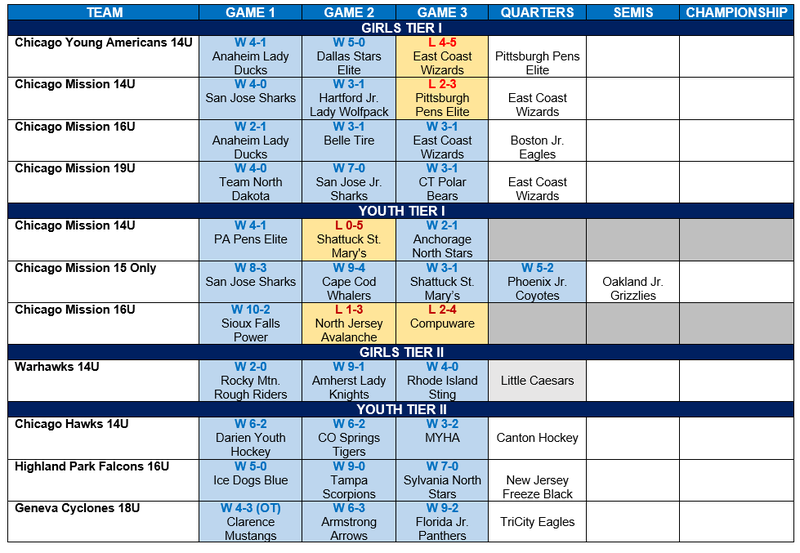 Eight Illinois teams have advanced to their respective USA Hockey National Championship quarterfinal rounds (see recap chart below for opponents and game times). Seven (7) teams went undefeated in pool play: The Chicago Mission Girls 16U and 19U, the Chicago Mission Youth 15s, the Northshore Warhawks Girls 14U, Chicago Hawks 14U, Highland Park Falcons 16U and Geneva Cyclones 18U teams. With their 5-2 win over the Phoenix Jr. Coyotes today, the Chicago Mission 15 Only team has advanced to the Tier I 15 Only Youth semifinals where they will face the Oakland Jr. Grizzles at 12:15pm (EDT) for the opportunity play in the 15-Only National Championship game! Good luck to all our teams on Sunday!!! Click HERE for the National Championships schedule or download the Nationals App from the Apple Store or Google Play. You can also watch all games LIVE on HockeyTV.